Planning a party, celebration, event, wedding, conference or need a venue for a group or class? We've got you covered. The Ballroom and Chamber can be hired separately or in any combination on a per hour basis. Partners receive substantial discounts on hire, as do charities and local residents. We also have full bar, catering and disco facilities with professional grade lighting and sound. 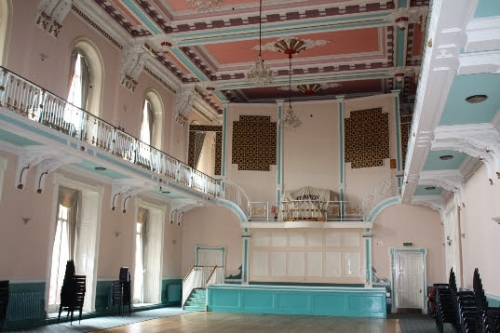 Beautiful ornate ballroom with balcony, bar, stage and professional lighting and sound systems. Check out that wonderful ceiling! Perfect for weddings and receptions, dances, parties, celebrations, large events, formal dinners, conferences and concerts. We can provide all bar, catering and disco facilities. The Chamber used to be where official town business was debated. 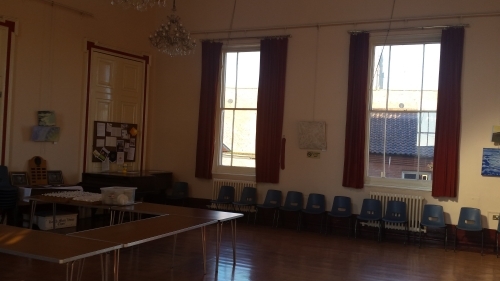 Now it makes a great setting for large meetings, exercise classes, choirs, lectures and learning, or as an extra space to complement the neighbouring Ballroom.